Leading international satellite market research and consulting firm NSR has identified that government and defense markets need to anticipate increased data, video and voice rates over satellite. 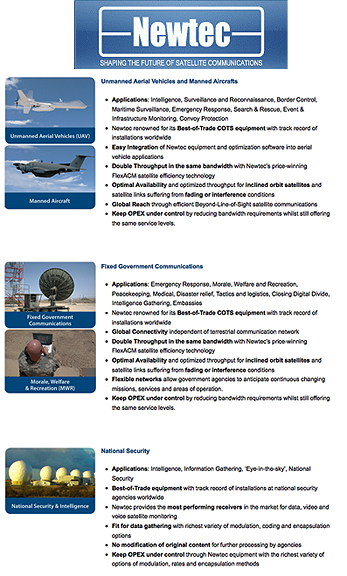 This echoes in satellite communications specialist Newtec’s award-winning technology FlexACM™. NSR’s report highlights a trend in the U.S., now being seen worldwide, of a rapidly increasing demand for communications over satellite. This is driven by the increasing numbers and video plus data traffic by Unmanned Aerial Vehicles (UAVs) and manned aircrafts, as well as advances in fixed government communications and national security technologies. Jose Del Rosario, Senior Analyst, NSR, said, “Cost considerations in the time of expected budget tightening coupled with tremendous pressure to offer creative solutions to address complex mission requirements for data and video should lead to tighter commercial partnerships over the long term. The commercial opportunity for the government/defense should grow at healthy levels. From $3.2 billion in 2009, NSR forecasts revenues to reach $9.2 billion at the end of 2019 with a representative Compound Annual Growth Rate (CAGR) of 10.9 percent." Newtec has identified these needs and translated them in the FlexACM technology. Newtec’s FlexACM solution is an advanced technology that provides auto-optimization of satellite capacity through a one-stop, end-to-end solution for IP backbone and IP trunking networks. The solution uses advanced technologies – Adaptive Coding and Modulation (ACM), Noise and Distortion Eliminator (NoDE), cross-layer-optimization and the Thin Margin Manager (ThiMM). All can be used individually to optimize the satellite link. However, when combined, FlexACM helps government and defence customers to get the very most out of the bandwidth available to them, doubling on average the throughput and pushing down operational costs. While in operation, the satellite link remains available at all times to ensure mission critical communications. FlexACM has been deployed on platforms supporting UAVs and manned aircrafts; as well as government fixed communications; Morale, Welfare and Recreation (MWR), intelligence through Commercial Off-The-Shelf (COTS) satellite communication equipment. The latest government and defense solutions from Newtec will be on display at MILIPOL, Paris, October 18 to 21, MILCOM 2011 in Baltimore, Maryland, November 7 to 10, and at the Global MilSatCom in London, November 29 to December 1st. Newtec will also be hosting two special webinars on government satellite networks to be held on December 13 at 6:00 p.m. CET and December 14 at 9:00 a.m. CET. To register, visit www.newtec.eu/government-webinar.